Action Typist: A-to-Z of Adventure: "R" Is for "Redemption"
A-to-Z of Adventure: "R" Is for "Redemption"
Since it is, after all, Easter, I'm going to wax religious for a moment. The comic above was in today's installment of Super Punch. I remember it well. As a regular Sunday School attendee and FOOM, I kept it in an honored place sandwiched between Capt. America and Daredevil. 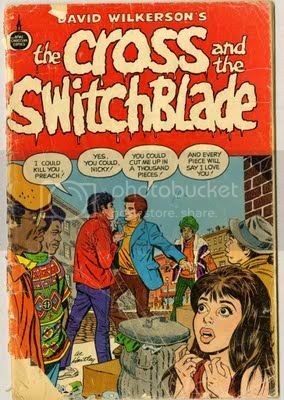 The Cross and the Switchblade originally appeared on book-form in 1963. Authored by evangelist David Wilkerson, it recounts the true tale of his first five years as a minister in New York City, where he struggled to shepherd young people away from drugs and gangs. The movie version starred Pat Boone and Erik Estrada. For more info on Wilkerson's ministry, see How It All Began | World Challenge. A-to-Z of Adventure: "X" Is for "X"
A-to-Z of Adventure: "W" Is for "Walter Sobchak"
A-to-Z of Adventure: "V" Is for "Von Daniken"
A-to-Z of Adventure: "U" Is for "Urth"
A-to-Z of Adventure: "T" Is for "Test Pilot"
A-to-Z of Adventure: "S" Is for "Scooby"
A-to-Z of Adventure: "Q" Is for "Quint"
A-to-Z of Adventure: "P" Is for "Planet Algol"
A-to-Z of Adventure: "O" Is for "Omega Man"
A-to-Z of Adventure: "M" Is for "McPharlin"
A-to-Z of Adventure: "L" Is for "Late"
A-to-Z of Adventure: "K" Is for "Kelly"
A-to-Z of Adventure: "J" Is for "Jonny Quest"
The A-to-Z of Adventure: "I" Is for "Ioun"
A-to-Z of Adventure: "H" Is for "Harry Palmer"
A-to-Z of Adventure: "G" Is for "Gandahar"
A-to-Z of Adventure: "F" Is for "Flint"
A-to-Z of Adventure: "E" Is for "Eastern Jewel"
A-to-Z of Adventure: "C" Is for "Catoblepas"